Okay, I got it in my mind that I needed a thistle square pattern, and everywhere I looked I could find nothing other than some kind of thistle-stitch or something like that, ha! So I sat around tinkering until I finally came up with this one! The first lighter green square I added more chains in round two than I state in the final pattern. (Those chains make up the four sides of the celtic-looking cross shape that makes the center of the thistle.) 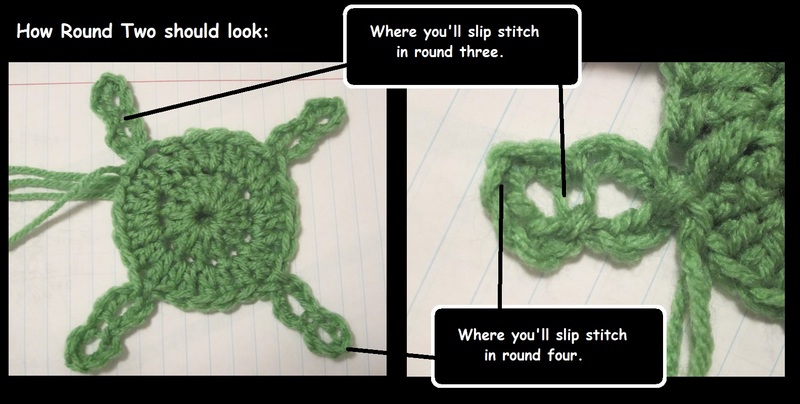 So throughout the pattern they look more loose than they will be for you, but I realized that the looser version made it easier to explain where to put the stitches so you can actually see what I did. If I didn’t find a way to extend the green from round two outward into the next two rows then the purple of the flowers kept blending in with one another and not having as much of a solid thistle-shape that I was wanting. So that’s why it’s done the way it is, and behold! Thistle Square!!! It’s a simple concept, but I pretended it wasn’t and took lots of close up pictures to detail it out just in case anyone is confused. Happy thistlin’! * I use a size K hook and Red Heart Super Saver Yarn. * Picot: Ch 3, sc in 3rd ch from hook. Rnd 2) Ch 2, 2dc in same st, 2 dc in each of the next 2 st, (ch 7, sl st in the 4th ch from hook, ch 2, sl st in top of same dc, 2dc) in next st. (That makes the dc that you will be using in rounds 3 and 4 so that you don’t have to use the purple. You’ll simply sl st in the bottom circle of this chain in Rnd 3 and use the top circle for Rnd 4.) *2dc in each of next 3 st, (Ch 7, sl st in the 4th ch from hook, ch 2, sl st in top of same 2dc) in next st. Repeat from * 2 more times. Join with a sl st in first dc. Fasten off green. Rnd 3) With purple, join with a sl st in the back of the center chain at the center of any chain-loop from Rnd 2. The purpose here is to try to not show/use the purple on these stitches so that the purple of the thistle will be more defined and solid. 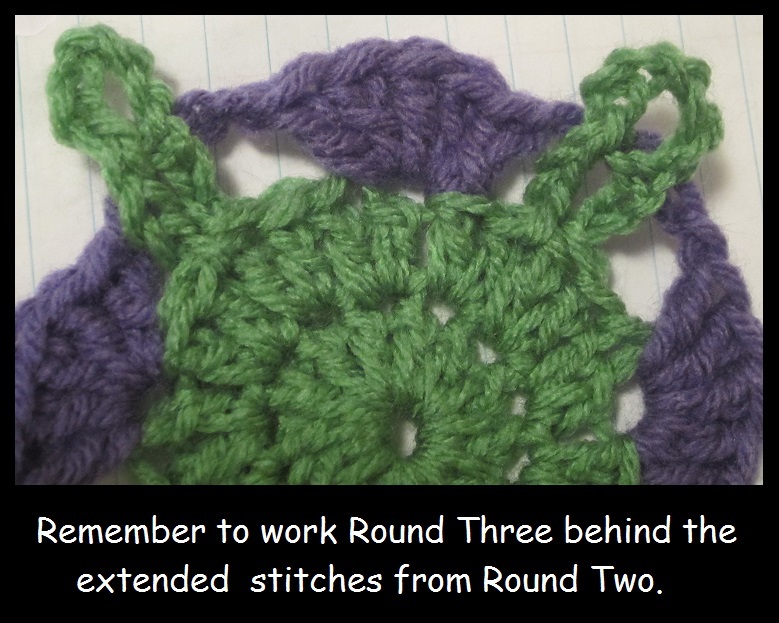 *Ch 2,sk next 2 st, 5 dc in next st, sk next stitches and sl st in the same spot as described before on the loop from Rnd 2. Repeat from * three more times. Rnd 4) Ch 2, sl st in the back of the very top center chain of the double loops from Rnd 2. (If you want to be extra picky about the flow of the square you can fasten off after Rnd 3 and join with a sl st in this spot instead of using this ch-2 join method. I just did that because I hate extra ends to weave in.) *Ch 1, (dc, picot) in the first st after that. (The beginning edge of the petal.) dc, picot, (dc, picot, tr, picot, dc, picot) in center st, dc picot in next st, dc in last st of flower, ch 1, sl st in top of double chain loop from Rnd 2. Repeat from * three more times. Fasten off purple. Rnd 5) Jn green with a sl st around any center top loop from Rnd 2. Ch 1. 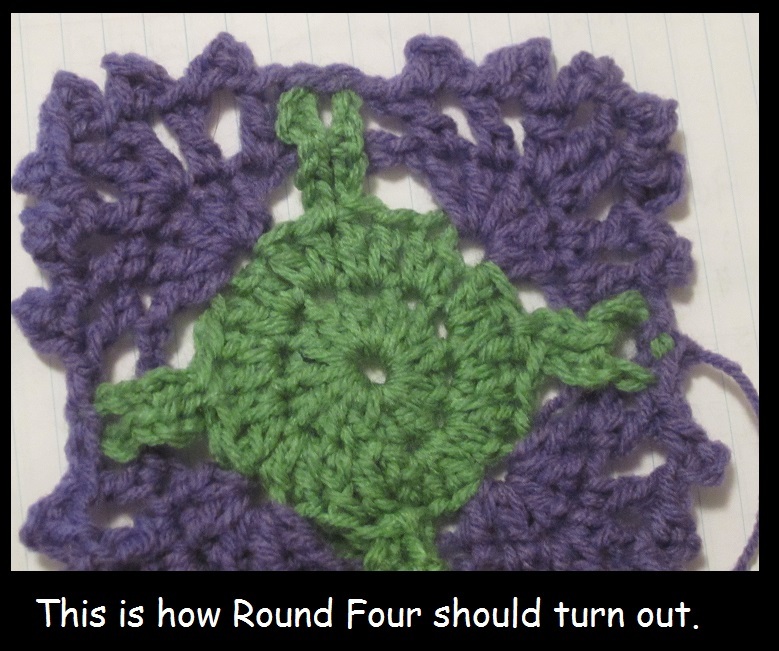 *Sc in the center space, 2sc in ch-1 space, sc in the back loops of the next two stitches making sure to work behind each picot stitch. (2sc, dc) in the back loop of the center corner stitch, (dc, 2sc) in the back loop of the next two stitch making sure to work behind each picot stitch again, sc in the back loop of the next st, 2sc in next ch-1 space. Repeat from * three more times. Join with a sl st in first sc. Rnd 6) Ch 2, dc in same center st. Dc in next 6 st, (dc, tr, ch-2, tr, dc) in corner, *dc in next 13 st, (dc, tr, ch-2, tr, dc) in corner st. Repeat from * two more times. Dc in last 6 st and join with a sl st in first dc. Fasten off and weave in ends. 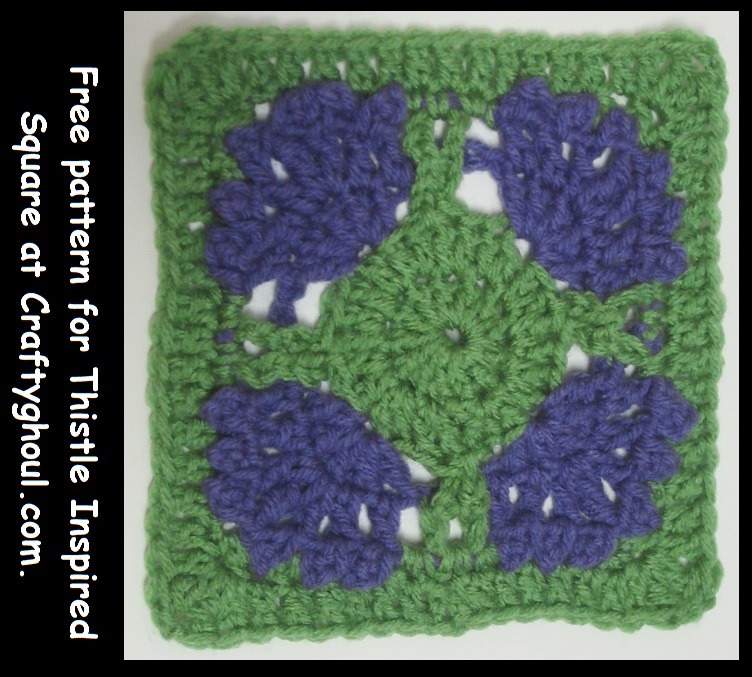 This entry was posted in Uncategorized and tagged crochet, crochet granny square, crochet pattern, crochet square, crochet thistle, free, free crochet pattern, granny square, pattern, square pattern, thistle. Bookmark the permalink.